Starting with this ruby glass painted rose bowl I stuffed it full with a floral bouquet I purchased from Costco. I was inspired to do something with fresh flowers after seeing a few recent blog posts showing beautiful arrangements. I always admired this rose bowl and after Dan's mother passed it was returned to us. My parents had gifted his parents with this for their 40th Wedding Anniversary so it represents a lot of sentiment. 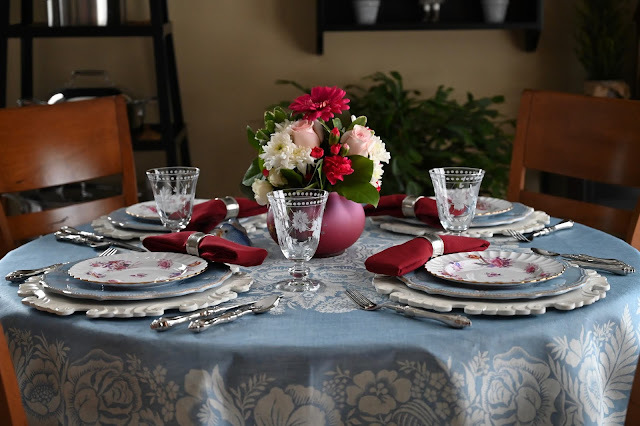 While visiting Pam at Everyday Living I was admiring her pretty blue dining room walls and was inspired to use something blue for my tablescape. I rummaged through and found these china dishes in my dish closet and they had just the right colors. 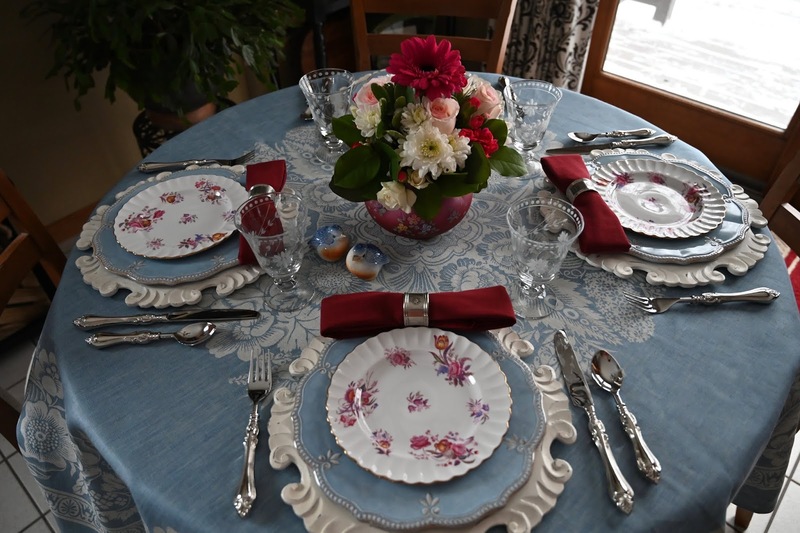 The blue dinner plate is a melamine pattern from Lenox and the white chargers are from Pier 1. The charges are such a versatile piece to have. 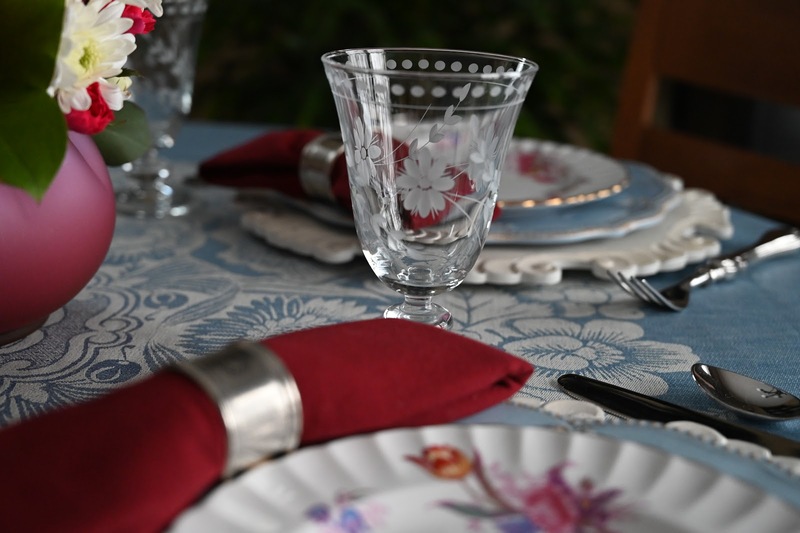 I found a deep red napkin and used some silver napkin rings from Pottery Barn. The silverware is called Baroque but right after I got them they were no longer availabe. I never had a manufacturers name. 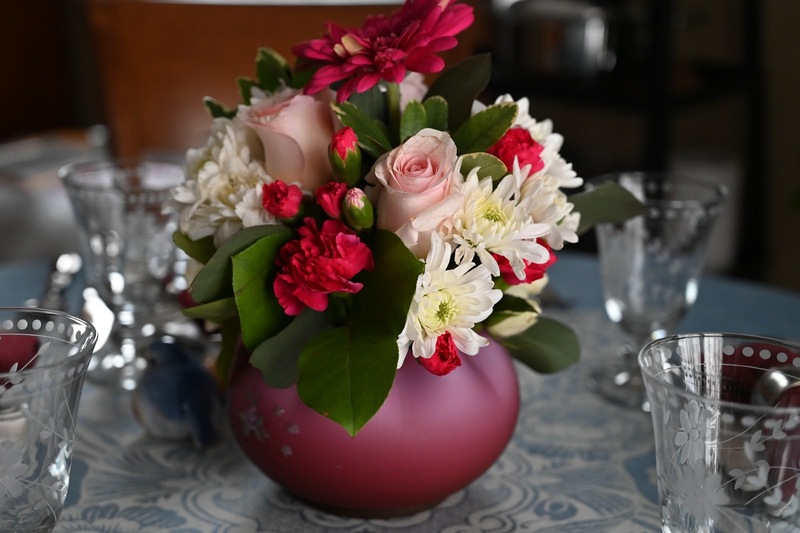 The bouquet included three soft pink roses that I adored, dark pink carnations, white chrysanthemums, miniature white roses and a dark pink gerber daisy. I didn't want this to look spring-like so I used the deep red accents. I was pleased with how well the blue tablecloth and blue dishes coordinated. The white chargers help create a visual break between the them. I ordered this from Williams Sonoma last year on a sale and this was my first time to use it. I adore their linens (not their prices)! I feel like they are heirloom quality. 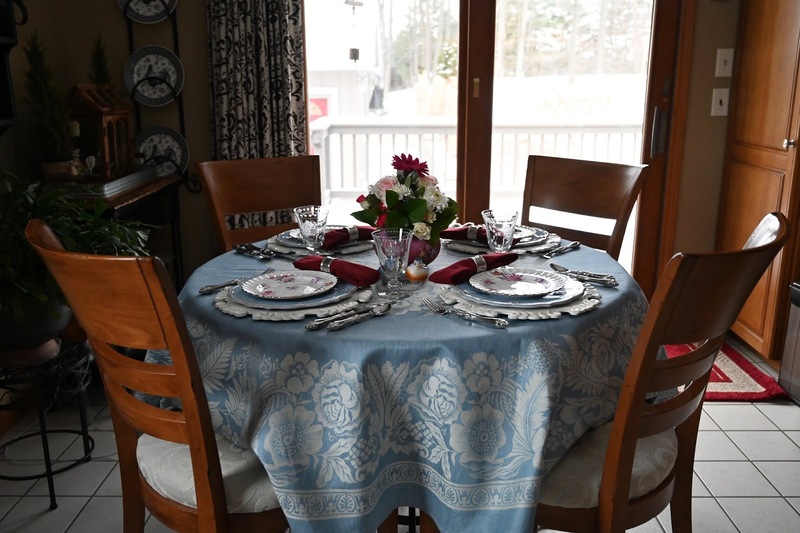 A perfect table for a luncheon with friends on a cold winter's day! As you can see outside is very white. 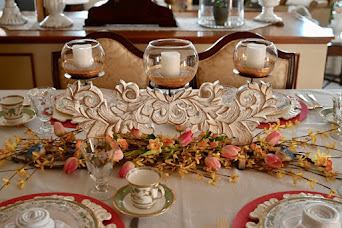 We have been getting snow just about every day lately and those deep frigid temps so I decided a rich and colorful tablescape was in order! 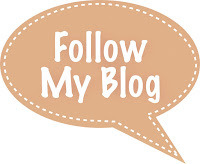 Thank you for visiting and I hope you'll leave a comment! Oh my how gorgeous, Liz! 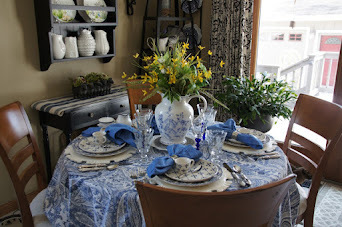 I am smitten with that WS blue tablecloth, it is gorgeous! 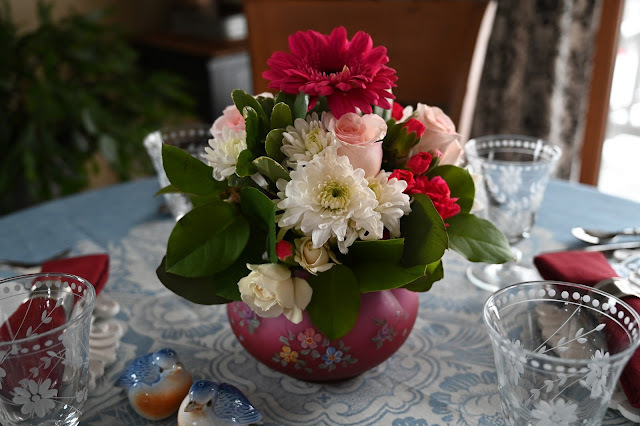 The sentimental ruby bowl is stunning with the lovely floral arrangement. Your plate stack is so lovely. I absolutely love everything about this tablescape. 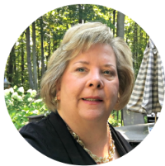 Thanks so much for the shout-out! 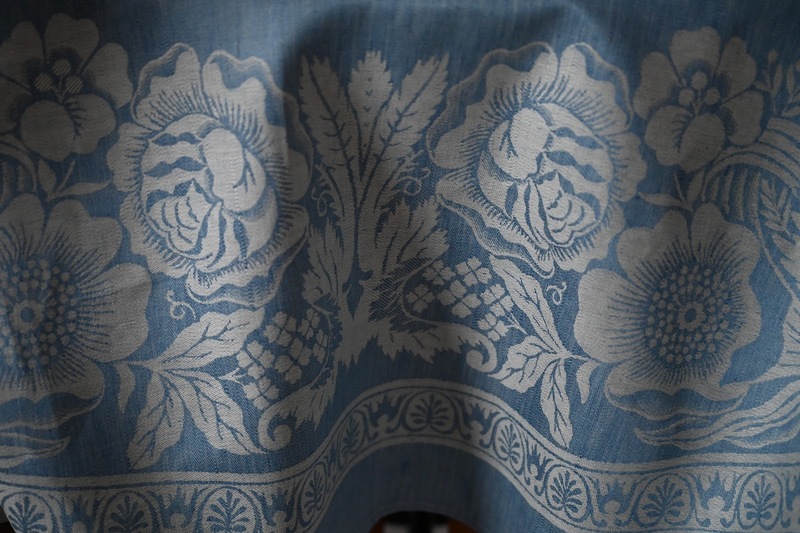 The blue tablecloth is so pretty. How sweet to use the rose bowl. Such a treasure to have. Your table looks so elegant. I am sure a cheery look inside, since you have so much snow outdoors. Beautifully done with style. 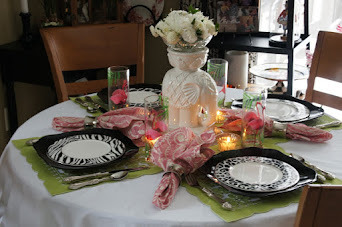 Are you joining Chloe’s Valentine tablescape blog hop coming up? First of all, I'm so glad you have your beautiful bowl/vase back. That's just lovely and it looks perfect with your pretty china. And the flowers are great. I need to join Costco, for flowers and gas, if nothing else! 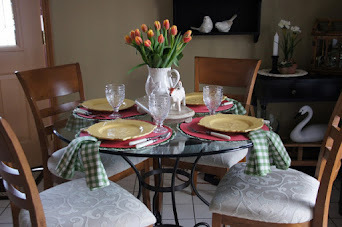 I love that blue tablecloth! 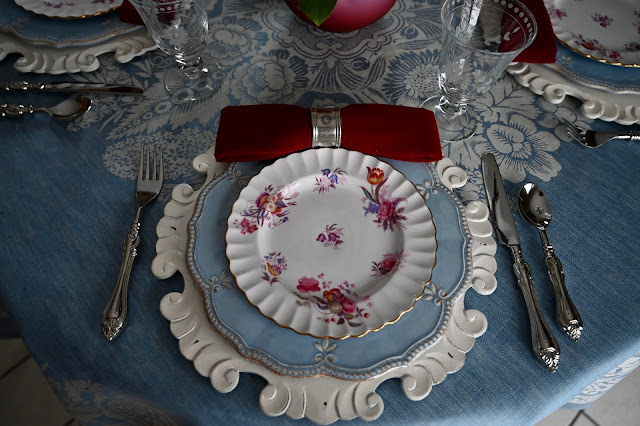 The dinnerware choices and chargers are exquisite! The vase is perfect size for your round dining table. Having a heirloom piece makes dining a special pleasure, indeed. What a beautiful tablescape!!! So fresh and charming!! Your dishes are drop dead gorgeous!! Exquisite tablescape!Stunning dishes and sweet birds.Beautiful flowers and gorgeous rose bowl.The tablecloth is elegant and beautiful...What an inspiring table! Beautiful table! I love that table cloth and the blue underplates with the flowered plates. Lots of snow and cold here too (central Iowa)... this table is the perfect antidote! Love the blue and white with deep red accents! Your table is a delight, Liz. I particularly like all the textures. 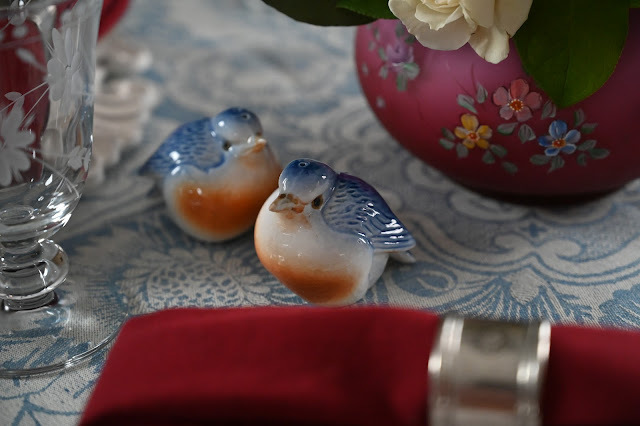 Love seeing your little pair of bluebirds on your pretty table with blues and reds. I always enjoy fresh flowers and your vase is perfect. Take care. 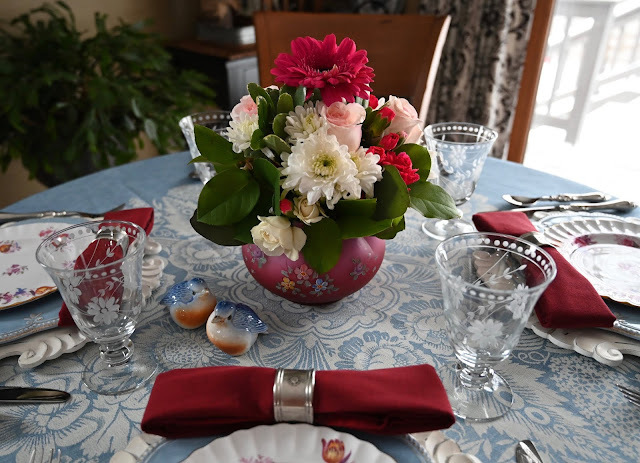 Oh Liz, the table is beautiful, and the sentimental items like that vase tell your story so beautifully. I really enjoyed reading this! Oh, this is elegant! Wow! The fact that the rise bowl has so much history makes it that much better. The overall look reminds me of the decor in the home of a billionaire I used to work for. Yes...BILLIONAIRE!!! 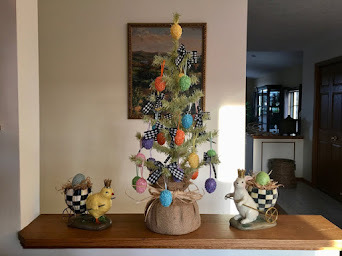 That’s how your creativity rolls, sister!!! 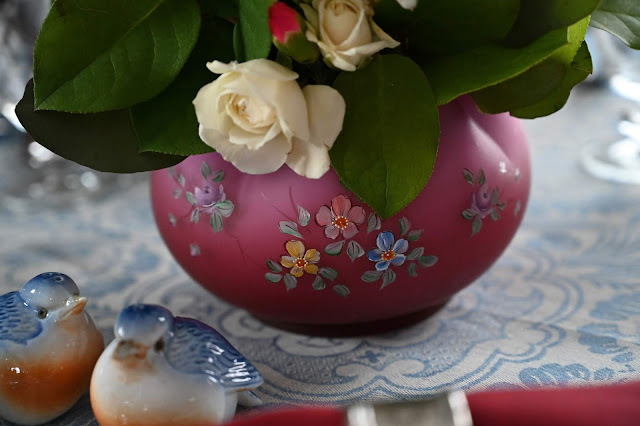 Oh the table is a beauty and I so love the rose bowl..what a treasure! 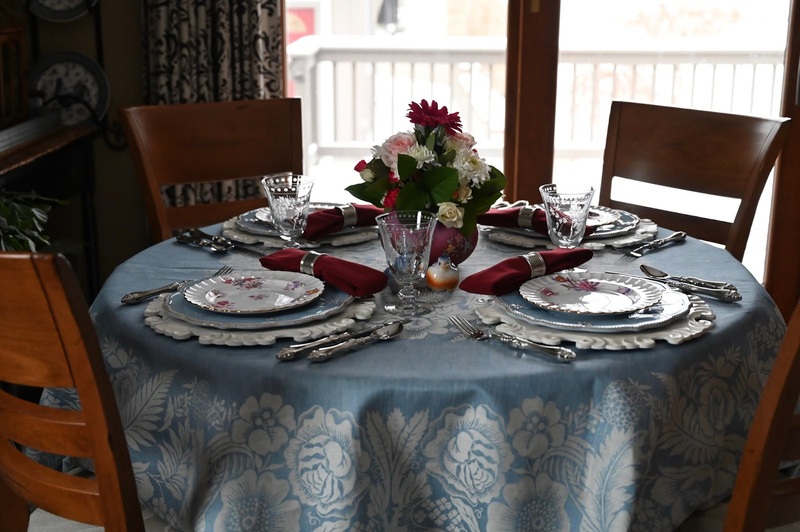 The tablecloth and goblets are truly beautiful...I need to visit WS more often!